The animation shows what the eclipse approximately looks like in Caracas. Stages and times of the eclipse are outlined below. All times are local time (VET) for Caracas. Maximum in Caracas This is the moment when the eclipse reaches its greatest magnitude while the entire Moon is above the horizon in Caracas. 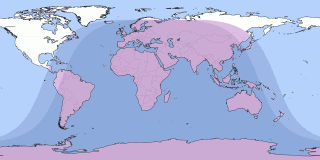 The true maximum point of this eclipse cannot be seen in Caracas because the Moon is below the horizon at that time. During this partial lunar eclipse, the Earth's shadow covers only parts of the Moon, as seen from Caracas. There are no other locations on Earth where the Moon appears completely covered during this event. The Earth's shadow covers only a small portion of the Moon. In the past, this day was cloudy 79% of the time (since 2000). Note: Click on the date link for details in Caracas, or the path map image for global details. Currently shown eclipse is highlighted.